Diet and oral health are the greatest preventive health measures we can provide for our pets. Dental health is stressed because tartar on teeth at the gum line is major source of chronic infection. Aside from local pain and potential tooth loss, periodontal disease allows bacteria to be absorbed in to the bloodstream through the inflamed gums (Gingivitis). The body responses to the bacteria with antibodies that combine to form complexes that get filtered by the kidneys and contribute to premature kidney failure. They also can affect liver and heart failure; just like in people. If you notice any of the signs, have your pet checked by your veterinarian. 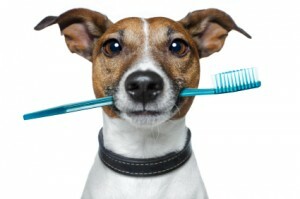 In the spirit of Pet Dental Month, Rosemont Pet Clinic is offering pet dental specials. Give us a call if you have any concerns or questions about your pet’s oral health. In our next post we will cover oral care options that we recommend to repair and prevent oral disease and demonstrate teeth cleaning for home care.